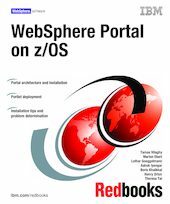 This IBM Redbooks publication will help you install, tailor, and configure the PTF2 level of WebSphere Portal Server for z/OS product. We discuss architectural, installation, configuration, administration, security and problem determination issues. We show you how to deploy portlets and how to convert a "normal" WebSphere application into a portlet. This book covers the WebSphere Portal for z/OS and OS/390 product, which is based on the WebSphere Portal V4.1 Enable edition.